OKLAHOMA CITY -- Tony Allen had a beef with the statistician. Dave Joerger was playing coy. Kevin Durant wanted to go to bed. Game 2 of the anticipated Oklahoma City Thunder-Memphis Grizzlies series was the type of playoff game in which almost too much happened. There were conservatively two dozen moments over the fourth quarter and the ensuing overtime that could've tilted the game. It's more convenient to have a goat and a hero, but little in this game was black and white. Either way, it looks like it's going to be a long series, after the Grizzlies' 111-105 victory knotted it 1-1 heading to Memphis. On a broad scale, it was simply a game the Grizzlies had to win. Not just to avoid going into a 2-0 hole -- that wouldn't have been catastrophic considering they fell down two games to the Los Angeles Clippers last year and came back to win. There just aren't going to be too many postseason games when Durant and Russell Westbrook will combine to miss 33 shots, or Beno Udrih will enjoy a six-minute stretch when he's the best guard on the floor. 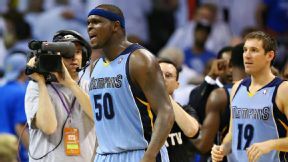 Ronald Martinez/Getty Images Zach Randolph (25 points) and the Grizzlies head home with the series tied 1-1. When outliers smile their way through the playoffs, especially on the road, the value of the game increases exponentially. The Grizzlies did not let it slip away. Even if Memphis did squander a five-point lead in the final 18 seconds of the fourth quarter. "Twitter must be going crazy right about now," Allen said in the locker room after the game, though he wasn't ready to turn his smartphone on just yet. "I can't believe they didn't give me a block. They gave me a steal, you gotta be kidding me. I wanted that block, man! C'mon, that was a block." Throughout the game Allen had acted like Durant's annoying little brother. He was constantly pestering him while the Thunder tried to lob the ball over the much smaller Allen like they were playing keep away. But the Grizzlies' defensive ace kept getting his hands in the way and in Durant's face. With 25 seconds to play before the end of the fourth he darted toward Durant's side, got his hands on the ball and forced a turnover for which he was unhappily credited a steal. "That was just blue collar," Allen said, popping on his plaid green and brown shirt. "I'm no star, I'm blue collar." Allen isn't a star, but he has battled the Thunder's biggest star reasonably well so far. In the first two games, Durant is 9-of-25 shooting when he has been guarded by Allen in the half court. Durant, who still ended up with 36 points Monday, is 10-of-18 against everyone else. When the Grizzlies stuck their necks out to give Allen a four-year, $20 million deal last offseason, it was for this kind of moment. It did look like that Allen steal/block had won the game for the Grizzlies, who calmly showed their playoff experience throughout the night by making some strategic adjustments and improving their focus and execution after a Game 1 loss. Of course, it wasn't that simple because Durant is Durant and the Thunder pay him appreciably more than Allen for this time of season. The presumptive MVP more than earned this game check by pulling off what can only be called a miraculous four-point play at the end of regulation that essentially forced overtime. Marc Gasol had 16 points, seven rebounds and seven assists but endured a miserable few minutes. He was caught gambling when he reached for a wobbly pass and fouled Durant as he was falling out of bounds. When Gasol heard the whistle, he shot his hands straight up in the air like a child who'd been busted sneaking a cookie, then groaned as he watched the ball go through the net. Still, the Grizzlies almost took it right there. But a decision to bring Gasol out to get in Durant's airspace for a final shot outside the 3-point line left Kendrick Perkins free near the basket to make a putback at the buzzer on Durant's miss, forcing overtime. "I was this close to getting the ball twice and we win there," said Gasol, holding his thumb and forefinger a centimeter apart. "But I didn't." Gasol then fouled out in overtime, though that ended up working in Memphis' favor and truly giving Allen his hero play of the night. With the game tied at 105, the Grizzlies were playing with a small lineup, which the Thunder prudently -- at least one would think -- matched. On a crucial possession with 30 seconds left in overtime, Joerger drew up a play that ended up with Zach Randolph getting a free layup that ultimately won the game. The small lineup left only Serge Ibaka to defend the rim and he oddly committed to Allen after he received a pass in the lane. When Allen made the perfect dish to a lonely Randolph around Ibaka, the design looked genius. "I'm not talking about that play," Joerger said. "It was a special." Well, the world has seen it now, though Joerger's modesty might've been a little misplaced. "I was supposed to be the decoy," said Randolph, who scored eight of his 25 points in OT. "Ibaka jumped after Tony and left me. I was happy to get that pass." All told, there were such small margins in this one that all of these endlessly fascinating plays could've easily broken differently. When this all gets settled by next week, it's possible this game will have largely been forgotten. But in the moment, everyone involved felt the pressure and gravity of the moment, and it was pretty fatiguing. "You want to get something to eat?" Westbrook asked Durant as they somberly left the interview podium late in the night. "Nah," Durant said. "I'm going home. I'm tired." MVP: Zach Randolph. Tony Allen is the soul of Grit 'N' Grind, but Z-Bo is its beating heart. Even after Kevin Durant hit his crazy, fallaway 3-pointer, Marc Gasol had fouled out and Kendrick Perkins sent the game into overtime, Randolph (25 points) wouldn't let his team quit. X factor: Mike Miller. The Grizzlies, in desperate need of long-range shooting, signed Miller this past summer to be their sniper off the bench. On Monday night, he played his part beautifully, hitting 3-of-4 from deep, including one in the fourth quarter that briefly gave the Grizzlies the lead just as it looked like OKC would go on a run. Defining moment: There are tough shots, there are impossible shots, then there are shots like the one Durant hit. Down by five with 18 seconds to play, Durant hoisted a fallaway 3-pointer from the corner while being fouled by Gasol. There was no way it should have gone in, yet it swished through the net. MVP: Blake Griffin scored a playoff career-high 35 points on 13-of-17 shooting, dominating any and every defender in his way. Thus far, the Warriors have no answer for him. He's averaging more than one point per minute (51 points, 49 minutes) in the series. LVP: Forty-eight hours after playing arguably the best playoff game of his life, Klay Thompson struggled with foul trouble and laid a dud. While he isn't as important as Steph Curry is offensively, Thompson needs to be more of a factor. That was ... a beating: The Clippers were out for blood from the opening tip and they never let their foot off the gas. They were locked in defensively and made a point to push the pace at every turn. When Hedo Turkoglu drops 13 points on you, you know it's not your night. Blake Griffin, Clippers: No foul trouble this time. Griffin, who fouled out of Game 1, made 13 of 17 shots en route to 35 points in the 138-98 rout of the Warriors that evened the series at 1-1. Reggie Jackson, Thunder: He missed all five of his shots in 14 minutes of action in the 111-105 overtime loss to the Grizzlies in Game 2. Meanwhile, Beno Udrih was going wild for the Grizzlies, dropping in 14 points. "I do anticipate talking with Phil Jackson at some point." 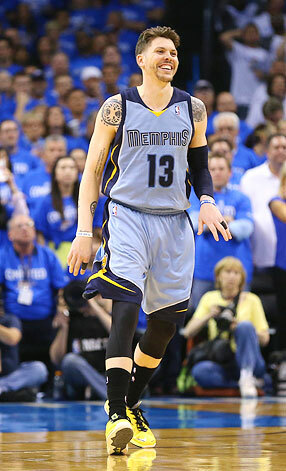 Ronald Martinez/Getty Images Mike Miller, who won two titles with Miami, is now giving the Grizzlies a boost. He sank 3 of 4 3-pointers in Memphis' overtime win in Oklahoma City. Kevin Durant (36) and Russell Westbrook (29) combined for 65 points in the Oklahoma City Thunder's loss to the Memphis Grizzlies on Monday. It's the most combined points by teammates in a playoff loss since Westbrook (43) and Durant (28) combined for 71 in the Thunder's Game 4 loss to the Miami Heat in the 2012 NBA Finals.